Getting to know me, everyone asks, 'how do you say your name'? And usually, 'where did it come from'? Then, they ask about the art. My name is Scottish Gaelic and translated to English, is ‘Elizabeth’. It’s a nod to my cultural heritage and my mother’s family, who are from the Loch Fyne and Glasgow areas of Scotland. What else is in my name? From a business standpoint, my name is my brand, and that stands for a style I’ve developed over a 35-year career in commercial art, including web, print, logo, book and magazine design. I started out drawing everything that didn’t get away fast enough as a kid, and I’m a third-generation oil painter, so painting was something I shared with my Dad, my great grandmother, and a cousin, and later, nieces and nephews. I hold two separate but related degrees in Graphic Design, Animation and Photography, but my true love is illustration, so, in this latest career iteration I’m focusing on portraiture and mixed media with digital compositing. Currently, my art studio is a one-person design shop, and I have the enormous privilege of working from my home. 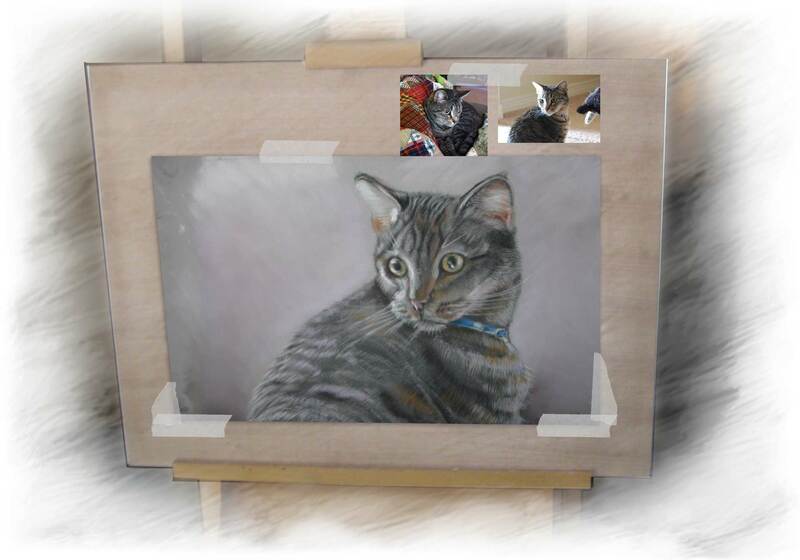 Pet portrait in progress – Todd, domestic shorthair cat, part of a series. Illustration of soft pastels on velour board. Finished size 12 x 16.